Daniel Escoriza (2015): Discoglossus pictus Otth, 1837. Au: Martínez, G., León, R., Jiménez-Robles, O., González De la Vega, J. P., Gabari, V., Rebollo, B., Sánchez-Tójar, A., Fernández-Cardenete, J. R., Gállego, J. (Eds.). Moroccoherps. Amphibiens et reptiles du Maroc et au Sahara occidental. Disponible à www.moroccoherps.com/fr/ficha/Discoglossus_pictus/. Version 11/01/2015. Consulté le 25 Apr 2019. Aire de répartition de Discoglossus pictus d'après l'UICN. Discoglossus is an endemic genus from the Western and Central Mediterranean, where it appears in a disjunct range in the Iberian Peninsula, northwest Africa, Sicily, Malta and the Tyrrhenian archipelago, and vestigially in Tuscany and some islets from La Provence (Knoepffler, 1962 ). The sister lineage of Discoglossus is Latonia, a genus formerly distributed along Central and Eastern Europe, but currently relegated to a tiny region in the southeastern Mediterranean (Biton et al., 2013;. Böhme & Vasilyan, 2014). Discoglossus pictus is the species from the central Mediterranean and is closely related to D. sardus (Pabijan et al., 2012). Both form the sister lineage of other ibero-maghrebian species of the genus (D. galganoi and D. scovazzi), whereas the Corsican D. montalentii is a basal split. Classically were considered two subspecies of D. pictus, separating the Sicilian populations (nominotypical) from these occurring in northern Africa. However, following recent phylogenetic studies, the genetic divergence observed between island and mainland populations is not enough to warrant the subspecific separation, so that all populations have to be assigned to the binomy D. pictus. Anuran of medium size, which can reach 80 mm of snout-vent length. Body robust, with a pointed snout and relatively long hind legs but incompletely webbed. Smooth skin, more granular in males in heat, with marked glandular cords after orbits. Eardrum visible, with relatively prominent eyes, showing the lower 2/3 dark and the upper 1/3 clearer. Irises teardrop-shaped. Ventral coloration yellow-whitish, but occasionally darker. Specimen with stripped-pattern, Beni Snassen. Photo: © Daniel Escoriza. In Morocco, it can be found all three forms of coloration (uniform, striped and spotted) within the same population; however the spotted pattern is more common, at least in the region of Beni Snassen. Three specimens of D. pictus, representing three separate geographic populations. From right to left, Beni Snassen (Morocco), Tabarka (Tunisia) and Palermo (Sicily). Photos: © Daniel Escoriza. Larva of small size, 20-30 mm of total length in the late stages of development, but it can reach up to 45 mm. Larval morphology of the benthic type (Escoriza and Boix, 2012), coloration variable, but usually dark brown. Low caudal fin, with a patent polygonal pattern. The ecology of this species in North Africa was described by Ben Hassine and Nouira (2009, 2012). These authors describe their reproductive activity extends throughout the year, being the adults generalist in its diet, feeding both aquatic and terrestrial invertebrates, but predominantly the latter (beetles, millipedes and woodlice), exceptionally including terrestrial vertebrates, such as geckos. 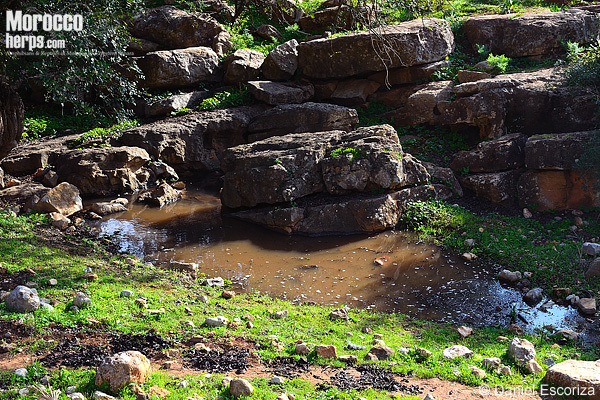 In northeastern Morocco its ecology is not well known. In this region this species also shows reproductive activity during most of the year but may be more limited or even absent in the warmer months. In general both adults and juveniles show terrestrial habits, but can also be found in the water. Adults display predominantly nocturnal activity, and like other amphibians, this is more intense with high humidity or rain. Possibly the Moroccan populations do not hibernate for prolonged time, since the threshold of activity of this species is above 9 °C (Knoepffler, 1962). Discoglossus pictus appears on the islands of Sicily, Malta and Gozo and more extensively in northwest Africa, from the Moulouya river valley to Tunisia, including some islands of the Tunisian continental shelf (Zangari et al., 2006; Ben Hassine and Nouira, 2012). 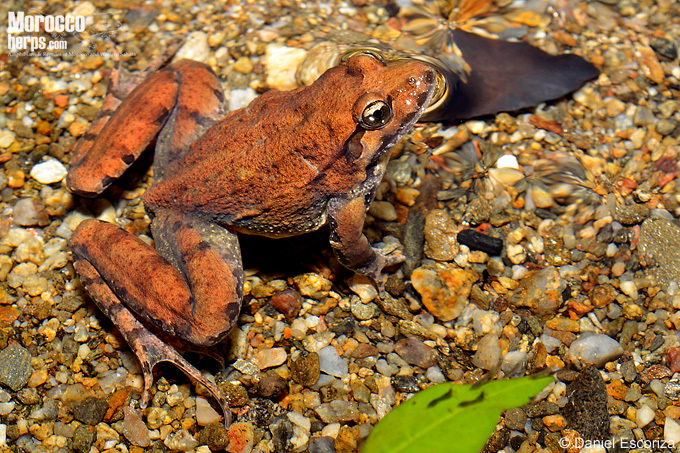 West of the Moulouya river valley is replaced by a morphologically similar species, D. scovazzi. The populations occurring in mainland Europe (southern tip of France and northeast of Spain) are likely of allochthonous origin (Martínez-Solano, 2004) and are described to be invasive (Escoriza and Boix, 2012). In Tunisia this species is widespread and extends from humid to arid ombroclimates, reaching the desert-oasis of Gabes and Tozeur (Ben Hassine and Nouira, 2012). 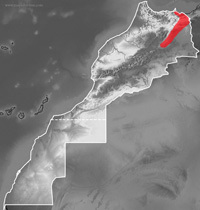 In Morocco show a more limited range, east of Moulouya valley, basically in the region comprising Debdou, the Beni Snassen and the Algerian border. This range is not reflected in the map of the IUCN. However its presence in this area was confirmed by molecular studies (Zangari et al., 2006). In Morocco, this species is present from the margins of semi-arid conditions in the valley of Moulouya, to the subhumid in the higher elevations of the Beni Snassen mountains. to the thermic forest (Oleo-ceratonium association). Photo: © Daniel Escoriza. 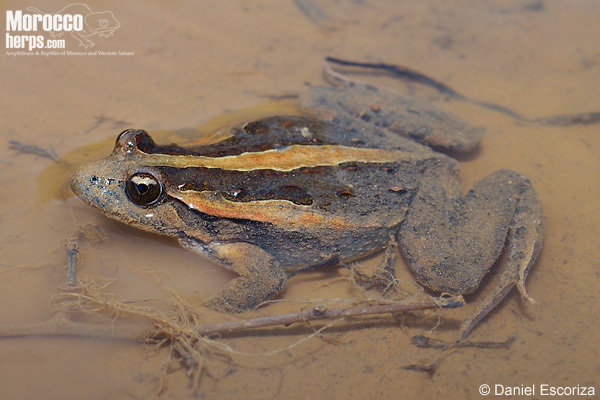 Unlike other species of amphibians, D. pictus is not very demanding about the conditions of the terrestrial and aquatic habitats, and can tolerate very high levels of water-salinity (Escoriza and Boix 2014). In the Beni Snassen it appears in mountain areas, reaching the 1400 m, in primary evergreen-oak woods, where it breeds in springs and streams (Escoriza and Comas, 2007) but also in the cultivated plains, occurring in traditional orchards and suburban environments, breeding in canals and artificial ponds. It is abundant or very abundant species in the wetter areas of the region, but its becomes scarce under more arid conditions, where it is completely linked to the existence of permanent water, such as springs and cattle-troughs. Ben Hassine, J., Nouira, S. 2009. Diet of Discoglossus pictus Otth, 1837 (Anura, Alytidae) and Pelophylax saharicus (Boulenger in Hartert, 1913) in the oases of Kettana (Gabes, Tunisia). Bulletin de la Société Zoologique de France 134: 321-332. Ben Hassine, J., Nouira, S. 2012. Repartition geographique et affinites ecologiques des Amphibiens de Tunisie. Revue d'Ecologie (Terre & Vie) 67: 437-457. Böhme, M., & Vasilyan, D. 2014. Ectothermic vertebrates from the late Middle Miocene of Gratkorn (Austria, Styria). Palaeobiodiversity and Palaeoenvironments 94: 21-40. Escoriza, D., Comas, M.M. 2007. Description of a new subspecies of Salamandra algira Bedriaga, 1883 (Amphibia: Salamandridae) from the Beni Snassen massif (Northeast Morocco). Salamandra 43: 77-90. Escoriza, D., Boix, D. 2012. Assessing the potential impact of an alien species in a Mediterranean amphibian assemblage: a morphological and ecological approach. Hydrobiologia 680: 233-245. Escoriza, D., Boix, D. 2014. Reproductive habitat selection in alien and native populations of the genus Discoglossus. Acta Oecologica, 59: 97-103. Knoepffler, L.P. 1962. Contribution a l'etude du genre Discoglossus (Amphibiens, Anoures). Vie et Milieu 13: 1-94. Martínez-Solano, I. 2004. Phylogeography of Iberian Discoglossus (Anura: Discoglossidae). Journal of Zoological Systematics and Evolutionary Research 42: 298-305. Pabijan, M., Crottini, A., Reckwell, D., Irisarri, I., Hauswaldt, J. S., Vences, M. 2012. A multigene species tree for Western Mediterranean painted frogs (Discoglossus). Molecular Phylogenetics and Evolution 64: 690-696. Zangari, F., Cimmaruta, R., Nascetti, G. 2006. Genetic relationships of the western Mediterranean painted frogs based on allozymes and mitochondrial markers: evolutionary and taxonomic inferences (Amphibia, Anura, Discoglossidae). Biological Journal of the Linnean Society 87: 515-536.